Filmistaan (2014) Movie Review: Filmistaan‬ is a 2013 Indian film written & directed by ‪‎Nitin Kakkar‬. Travelling around the film festival circuit for quite some time and even bagging numerous international awards, this movie plays tribute to Bollywood cinema. ‪‎Filmistaan (2014) Movie Review: Filmistaan‬ is a 2013 Indian film written & directed by ‪‎Nitin Kakkar‬. The film was screened at the Busan International Film Festival, the Mumbai Film Festival, and the International Film Festival of Kerala, where it won the The Silver Crow Pheasant Award for Best Debut Film in International Film Festival of Kerala. Filmistaan is receiving rave reviews from the industry. A bevy of stars were present at the film screening last evening. 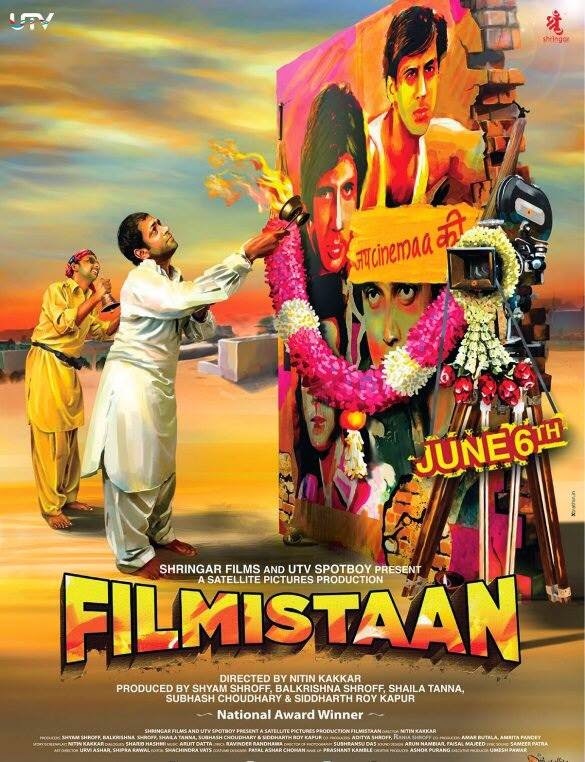 If you're a fan of Cinema, love humour & darling actors, ‪Filmistaan is one of the must-watch movies this year! Travelling around the film festival circuit for quite some time and even bagging numerous international awards, this movie plays tribute to Bollywood cinema. Great acting, hilarious characters with a message of peace. Mostly all the film critics have rated the movie 4 or more out of 5. Film critic Taran Adarsh wrote in his review, "Filmistaan stands tall thanks to its superior writing, besides benefiting tremendously from its strong casting. Both Sharib Hashmi and Inaamulhaq are a complete revelation, slipping into their respective parts with astonishing ease." Mohar Basu from Site Koimoi.com says,"Nitin Kakkar’s Filmistaan is a crackling movie to the core that doesn’t give you one dull moment in its lambent tapestry. Sharib Hashmi is precocious for a debutant and along with Innam’s adept performance, the duo deliver a effulgent film."